Many of you are deciding whether to join us for Campamento 2019. We’ll have 2 weeks: June 18-25 and August 5-12 . Here are some thoughts that might help you make the decision. Everyone has gifts to share! This is a wonderful way to use them. Although the trip is challenging at times, we learn so much and benefit from the trip spiritually, personally, and culturally. I think I’m a better parent when I return from Campamento. 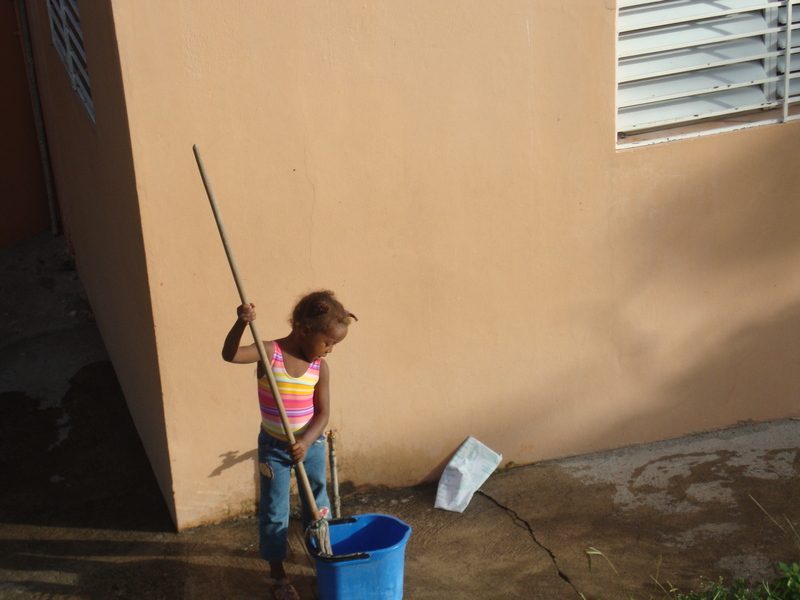 The picture above is a 6 year old doing her morning chores – mopping. Do you think my kids mop at home? Well they do after camp! It’s great because the kids contribute to family life and learn how to take care of a home themselves. Every girl in the hogar(home)has chores to do. They feel like a valuable member of the family. They accomplish something themselves. Wow! If you are interested in taking this trip or contributing in another way, please think about what you’d like to get from the trip. because we lack what you have. by the type of shackles you wear. because we don’t follow your stride. because we can’t follow your tempo. because we can’t read your signs. which you can share with us. Why are you thinking of doing this? What is your purpose in going? What are your hopes and dreams for this journey? How do you feel about traveling so far from home? What might it mean to you to offer a hand, not a handout? How do you think you would receive a hand on your shoulder? How will your needs be met by this venture? How do you respond when things veer away from a plan? Do you get upset or do you roll with the punches? How will you contribute to the trip? Do you have specific talents, experience, or career you can share?